– Sometimes, the map was not visible on the airbnb.com, when ad blocker was turned on. Now it’s fixed, and you can book your holiday. – This build Includes a bunch of languages fixes, especially the ones you spotted, and reported. – Visual fixes for some annoying glitches (you might not have spotted them, but we did). – Video pop out gets more tweaks. – [macOS] Sidebar extensions have regained focus, and are working correctly again. – [macOS] Full screen is not broken anymore, after auto-playing videos on YouTube. – New check intervals for personal news: 3, and 6 hours. – The bookmarks popup sometimes contained “Finished” button, while “View in Bookmarks” was expected – fixed. – The bookmarks manager didn’t allow to restore folder from the trash bin – fixed. – [Windows][Security] We added .scf to the risky file extensions list. – ‘Blinking address’ issue is fixed (some of you complained about that). – @Nico we fixed “Über%tragen…” in the context menu – you’re welcome!" Settings page seems to be bugged. You can't see what is selected. Before the update to version 47 I was able to disable the " Disable autoplay in background tabs" ( :faint: ) option. Now if I middle click on a video on YouTube it won't start automatically in the background - I have to click on the tab so that the video will start. Something that I do not like at all! Can't get it to work like I want from the flags menu. 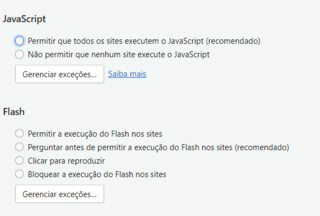 Hi @bobeca, the #disable-gesture-requirement-for-media-playback was recently replaced with the #autoplay-policy, but this change might have broken the feature, so it has to be fixed on the Chromium's side - the source link. Will this be fixed in the near future? Already mentioned in this tropic. I also can't seem to stay logged into my Opera account. Yes. I can sign in just fine from the Forum front page, but then the browser "freezes" on the redirect page. I have to manually click on the redirect link, which does take me to the Forum but I am not logged-in anymore. Turns into a vicious cycle. 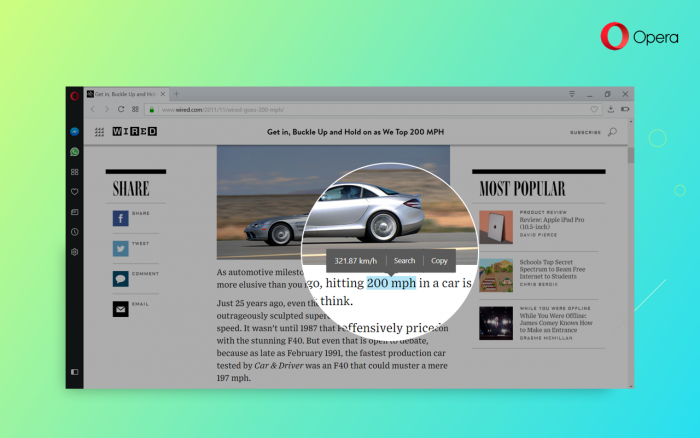 The search pop up has been a principal feature for our browser since the release of Opera 39, creating convenience for users to search, and copy any text they highlighted. We later tacked on the currency converter to the pop up in Opera 42, easing online shopping. Now, converting distance, weight, volume, speed and temperature from the convoluted imperial system, to the standard metric system (or vice-versa) is as easy, as highlighting the value. Yet another reason to forgo your calculator, and math skills – Opera will do the work for you. You can turn the search pop-up on, or off in the Preferences, under the Browser -> User interface settings. – We extended the ‘Recently Closed’ tabs list limit to 32 from the original 10. – The difficult-to-read white text seen on folders in dark theme, with no wallpaper on the Speed Dial has now been made readable. – The radio buttons in the Settings are made visible again. – Windows 7 Aero users should no longer see occasional flashes of background images, when switching between Youtube videos. – Improved color contrasts in light theme for better readability. – In bookmarks, you’ll find the option to export all bookmarks. 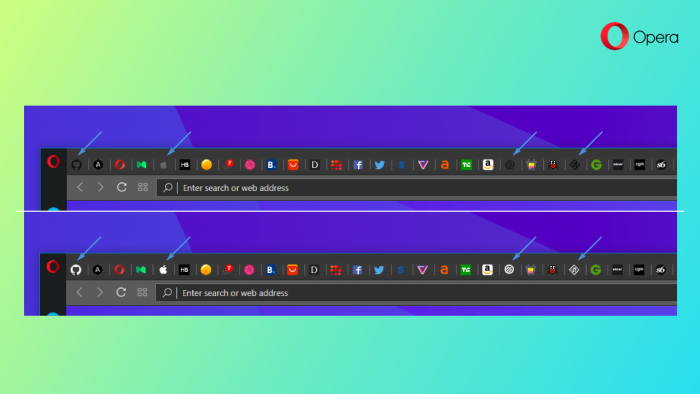 – Dark favicons are now visible in dark theme. Try it yourself by visiting spotify.com. 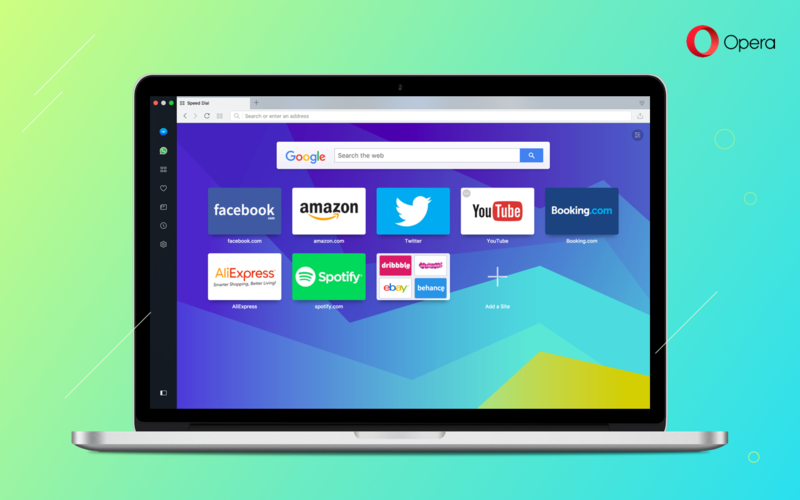 – The Chromium has been updated to version 60.0.3107.4.